NOTICE: Activation key must be used on a valid Steam account. Requires an internet connection. 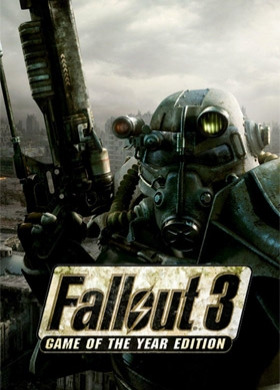 About the game With Fallout 3: Game of the Year Edition, experience the most acclaimed game of 2008 like never before. Create a character of your choosing and descend into an awe-inspiring, post-apocalyptic world where every minute is a fight for survival. Key Features … Fallout 3: Game of the Year Edition includes the original game as well as all five of the Fallout 3 Game Add-on Packs: Operation: Anchorage Enter a military simulation and fight in the liberation of Anchorage, Alaska from its Chinese Communist invaders. The Pitt Travel to the post-apocalyptic remains of Pittsburgh and become embroiled in a conflict between slaves and their Raider masters. Broken Steel The wizards at Vault-Tec have done it again! No longer constrained to just one view, experience the world from 1st or 3rd person perspective. Customize your view with the touch of a button! The Power of Choice! Increase your level cap to 30, and finish the fight against the Enclave remnants alongside Liberty Prime. Point Lookout Embark on a mysterious and open-ended adventure in a huge, murky swampland along the coast of Maryland. Mothership Zeta Defy hostile alien abductors and fight your way off of the alien mothership, orbiting miles above the Capital Wasteland. System Requirements Windows - Minimum OS : Windows XP/Vista/Seven Processor : 2.4 Ghz Intel Pentium 4 or equivalent processor Memory : 1 GB (XP)/ 2 GB (Vista) Hard Drive : 7 GB available space Graphics : Direct X 9.0c compliant video card with 256MB RAM (NVIDIA 6800 or better/ATI X850 or better) Sound card : DirectX 9.0c Controller support : Xbox 360 controller *Requires log-in to Games For Windows - Live Windows - Recommended OS : Windows XP/Vista/Seven Processor : Intel Core 2 Duo processor Memory : 2 GB RAM Hard Drive : 7 GB available space Graphics : Direct X 9.0c compliant video card with 512MB RAM (NVIDIA 8800 series, ATI 3800 series) Sound card : DirectX 9.0c Controller support : Xbox 360 controller © Fallout® 3: Game of the Year Edition © 2009 Bethesda Softworks LLC, a ZeniMax Media company. Bethesda Softworks, Bethesda Game Studios, ZeniMax and related logos are registered trademarks or trademarks of ZeniMax Media Inc. in the U.S. and/or other countries. Fallout, Prepare for the Future and related logos are trademarks or registered trademarks of Bethesda Softworks LLC in the U.S. and/or other countries. All rights reserved.